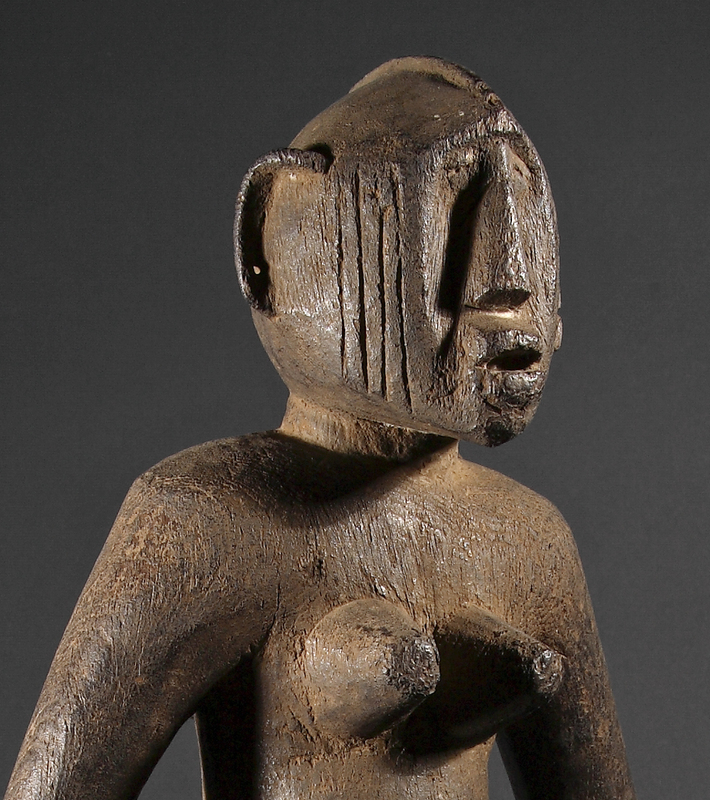 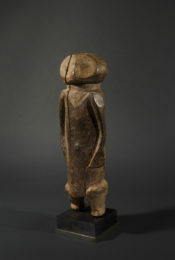 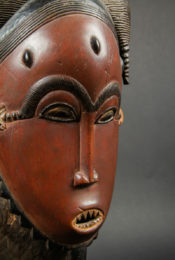 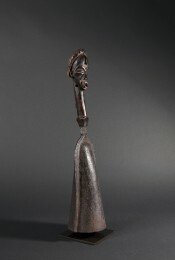 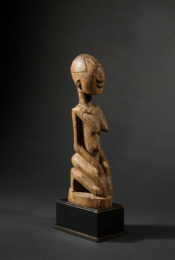 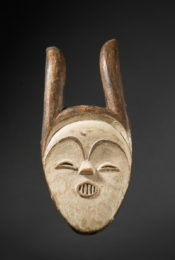 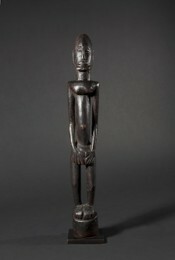 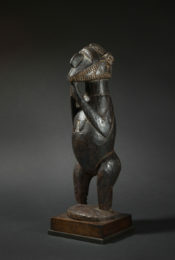 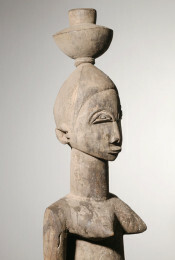 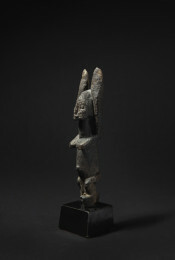 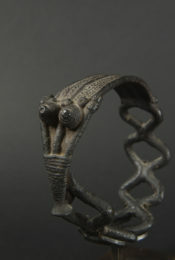 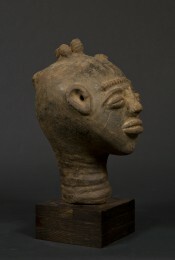 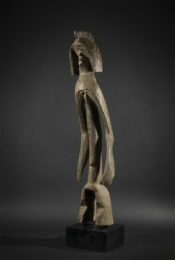 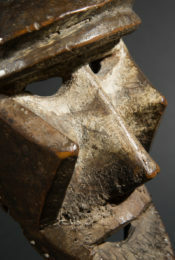 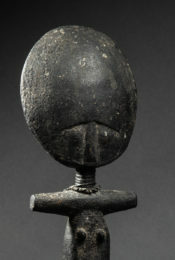 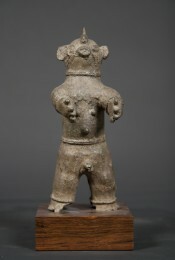 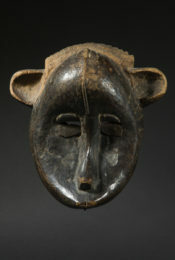 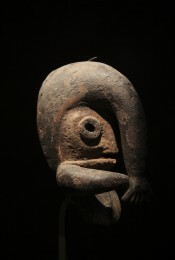 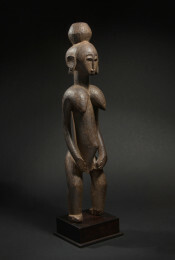 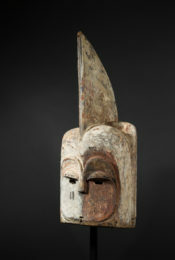 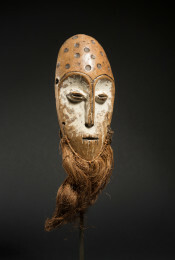 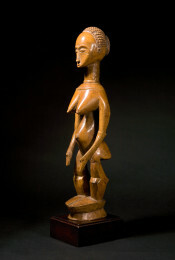 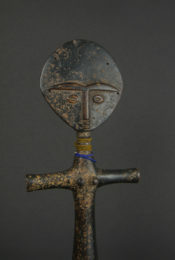 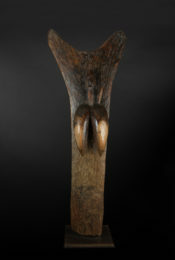 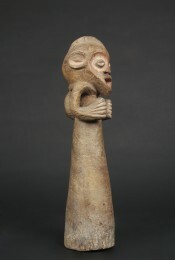 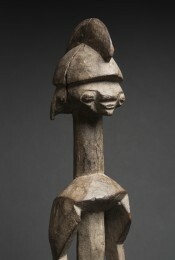 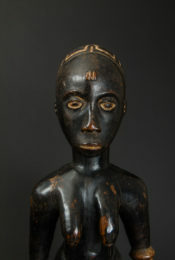 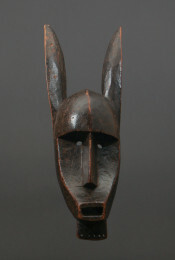 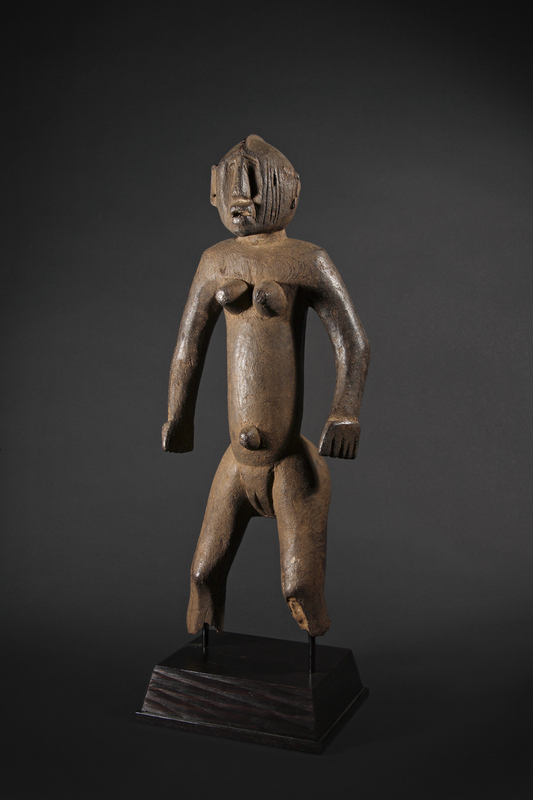 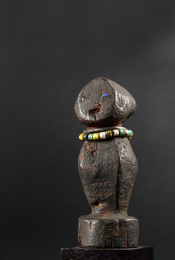 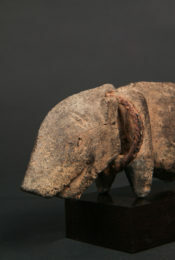 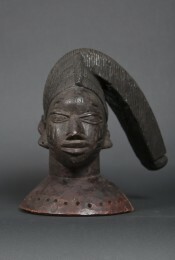 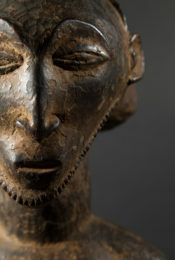 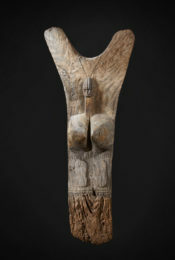 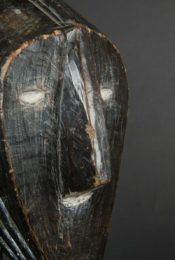 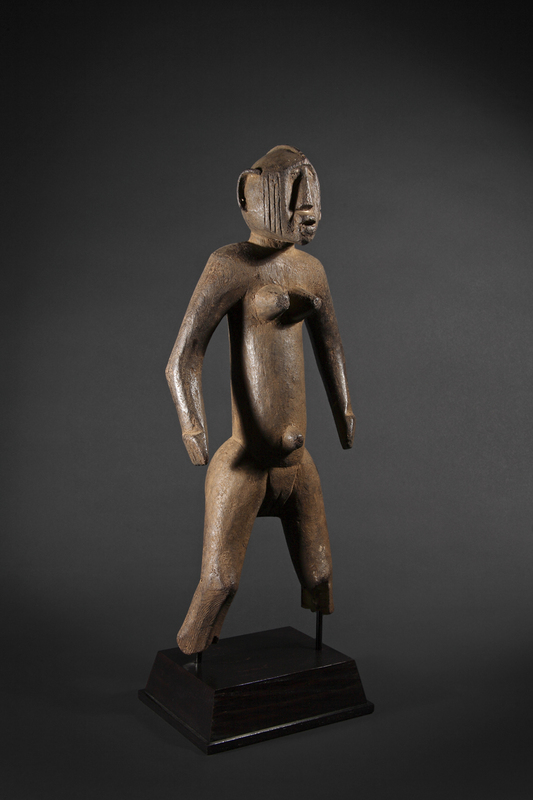 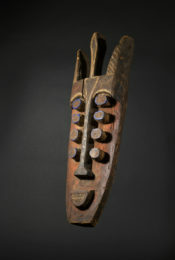 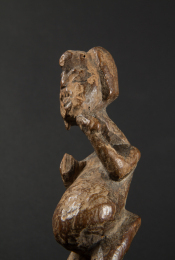 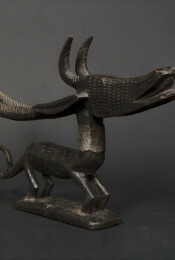 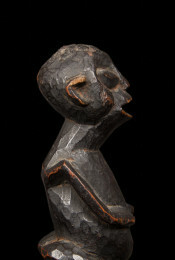 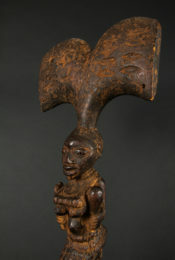 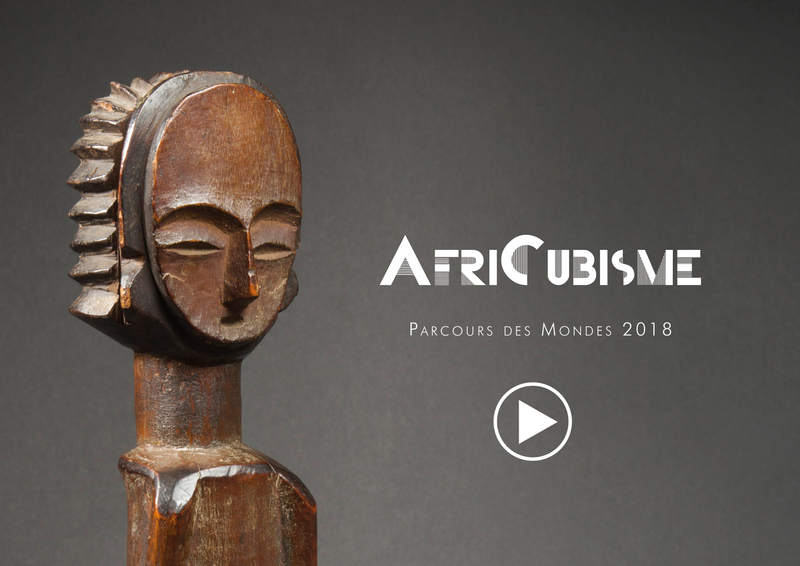 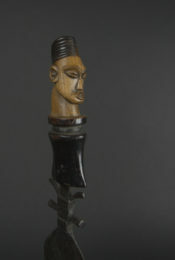 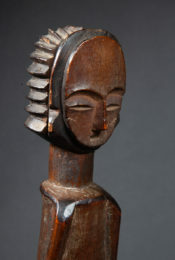 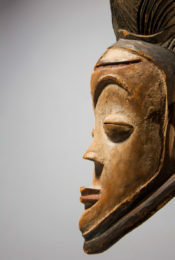 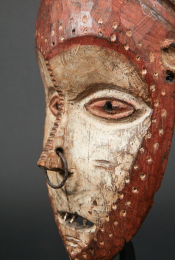 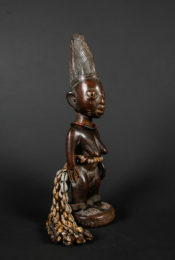 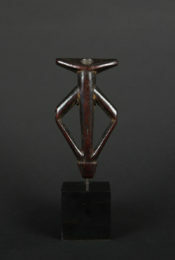 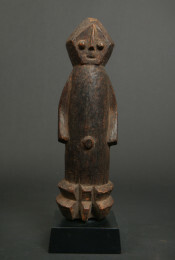 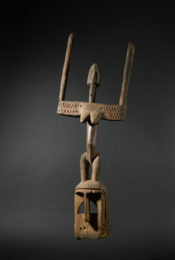 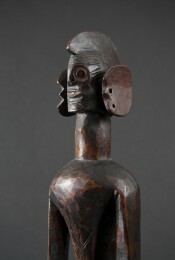 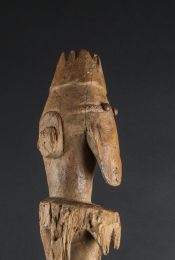 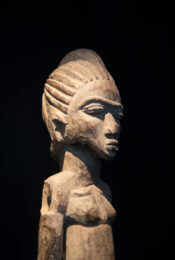 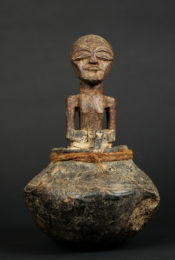 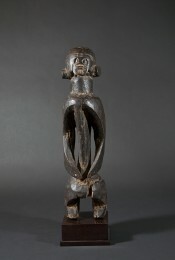 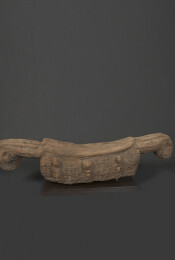 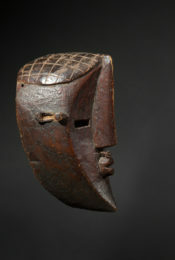 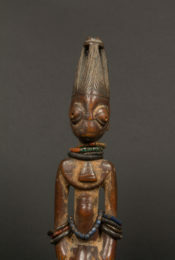 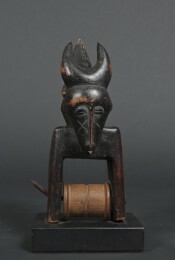 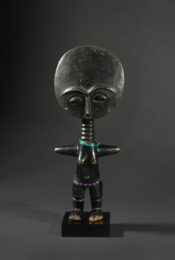 This female figure is an exceptionally expressive and powerful example of ancient Burkina Faso art. 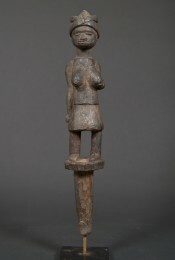 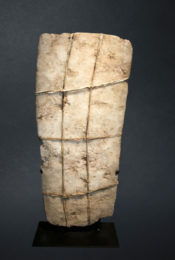 The figure honors a woman whose great age, wisdom, and experience elevated her to the rank of a living, an ideal intermediary between the living and the spirits of the family's ancestors. 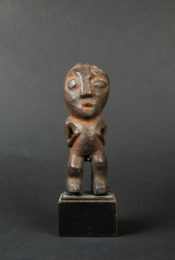 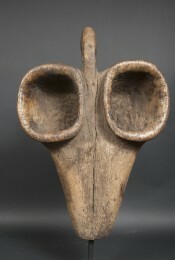 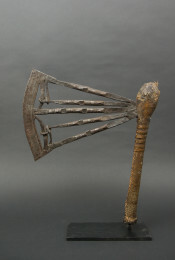 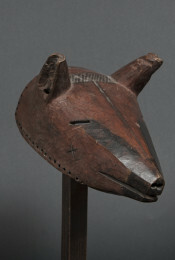 Although this figure was long thought to be Mossi or Bobo Fing, recent studies would rather point to a Bobo or Tiéfo (Tchifo) origin. 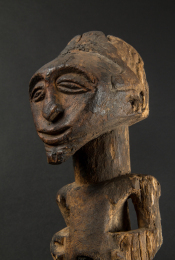 As early as the beginning of the 20th century, such authors/ethnographers as Ruelle (1904), Tauxier (1917) and Frobenius (1926) started mentioning Upper Volta (now Burkina Faso) statuary; but it was not until the 1960s that the meaning of such sculpture was understood. 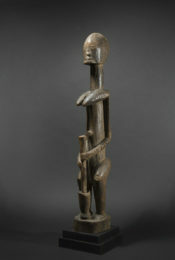 According to Roy ("Art of the Upper Volta Rivers", 1987), the main role of these statues is to affirm the authority of the chief (naba). 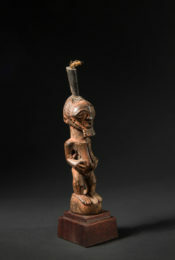 They personify him either at his funeral - and they are in that case ephemeral - or in the context of the annual sacrifices offered to ancestors - male or female - and are then kept for the rest of the year inside the kimse roogo, the hut of the chief's oldest wife. 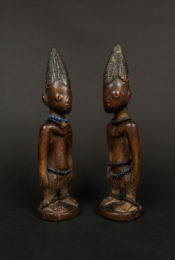 Their very occasional use and conservation in a place protected from view explain why these statues are so rare, each one having its own distinctive style. 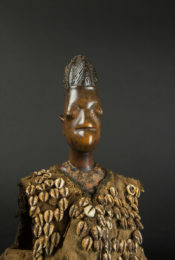 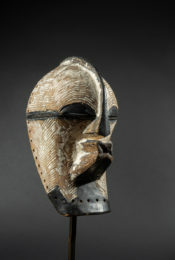 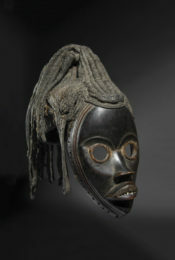 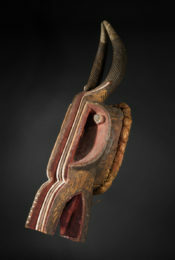 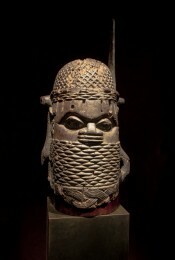 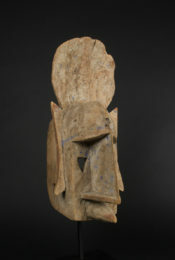 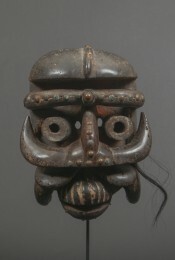 According to Roy, "an artist sometimes only sculpts one or two statues of a chief in his lifetime; and he can only work for one or two chiefs in the region. 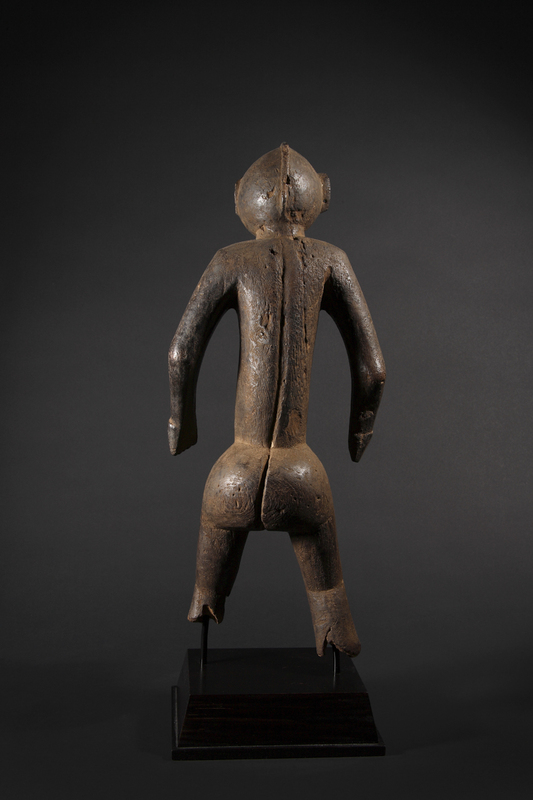 Thus, the statues kept by a chief are frequently the result of work carried out by several sculptors over several generations of chiefs of the same clan." 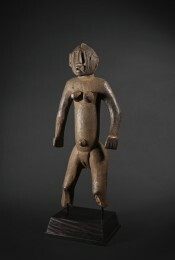 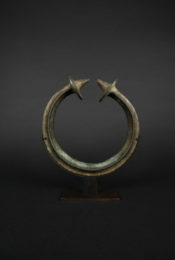 This rare female figure conveys an intense sense of sacrality and strength.